Quick summary: Students explore biographies as a text type through exploration of the documentary Paul Kelly – Stories of Me. Focusing on childhood, family, place and memory, students complete a number of visible thinking routines to develop their understanding of biographical elements. They then apply their understanding of the nature of representation in biographical texts by interviewing a person about their experiences growing up, and represent the information in their own biographical text. This lesson uses sections of Shark Island Production’s Paul Kelly – Stories of Me as learning stimuli. Teachers are required to create an account on the film’s website to view the film. Upon registration you will be given a code – give this to your students so that they can access the film too. A biography is the representation of someone’s life. It is generally accepted that biographical accounts are based in the truth, however it is interpreted through the biographer. There are different elements in a person’s life that make up their biographical story. General capabilities: Literacy, Critical and Creative Thinking, Personal and Social Capability, Intercultural Understanding, ICT Capability. Resources required: Student Worksheet – one copy per student (this lesson works best if the worksheet is printed). Device capable of presenting a website to the class. Copy of Paul Kelly – Stories of Me (teachers are required to create an account to view and invite students to view the film). Venn Diagram print out, Question print-outs (linked here, here, here, here and in the Teacher Worksheet), Blu-Tack, sticky notes, recycled scrap paper for students to sketch on. Keywords: Biography, story, childhood, place, memory, Paul Kelly. Overarching learning goal: Students will learn about biography and its various textual elements. They consider the subjective nature of biographical texts, and will understand that a biographical account is not the raw truth; instead it is being told through a creator - in this case, a filmmaker. 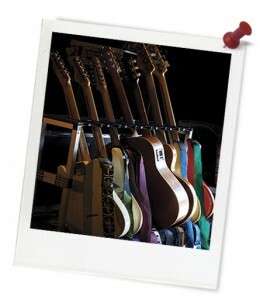 Teacher content information: This lesson is based on the documentary film Paul Kelly - Stories of Me, which charts the many lives, loves and losses of Paul Kelly, one of Australia’s most gifted singer-songwriters. His songs have been marking out the Australian landscape and its people through words and music for almost 40 years. 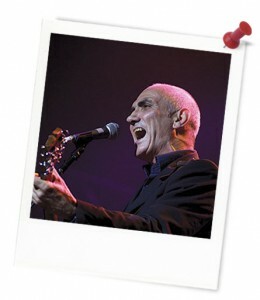 The stories and the music of Paul Kelly explore and reflect the Australian experience, life and culture. 2. 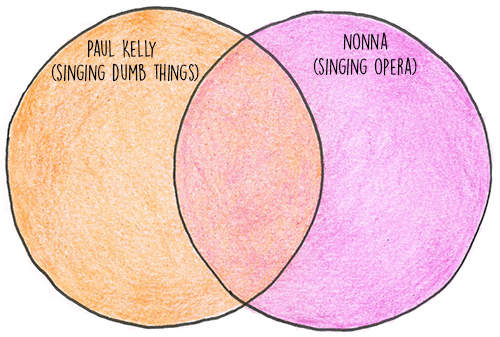 Draw (or print out) and fill in this Venn diagram to describe the differences and similarities between Paul Kelly and his Nonna's singing.